Getting around in GoldenEye: Rogue Agent is a simple matter. The main menu has three options: Campaign (the single-player mode), Virtual Training (with both single-player training and multi-player training), and Options. Single-Card Play is then right on the Virtual Training menu. Opening credits consist of only two screens, though one of them stays on-screen much longer than usual with no way to skip. Download Time was average, or perhaps a bit faster. The game's menus consist of very large, well-defined buttons with large, clear labels and proper buffer space. There are four control schemes in GoldenEye: Rogue Agent. In Single-Card Download play, two of them (Stylus Control and Thumb Control) become identical because their differences apply only to the single-player Campaign mode, leaving three distinct control schemes. This provides several options which can be hot swapped -- changed on the fly quickly by, in this case, tapping on-screen icons. Despite having there options, none of the control schemes seem to be fine-tuned like they could have. One example is that turning by using buttons (Left-Handed Button Controls) or the direction pad (Right-Handed Button Controls) is slow. Another example is that turning or looking around using the touch screen (for all control schemes) is inaccurate and tends to jump around a little bit. Neither of these examples really broke the gameplay, but it did make the gameplay more annoying and gave it a longer learning curve (the amount of time needed to learn to control the game accurately). Anyone who practices will get used to the eccentricities and can work around them, if they can pick their control scheme and work through their early frustrations. Graphically, the game is a 3D First-Person Shooter, and looks pretty good for a year one original Nintendo DS release. It's not anywhere near as impressive as current 3D graphics on Nintendo DS games, but for when it came out, it was impressive. Audibly, the game sticks to sound effects to keep up both the mood and the ability to react to sound. The game's audio will focus on hearing movements and weapons fire. There are no selectable options. 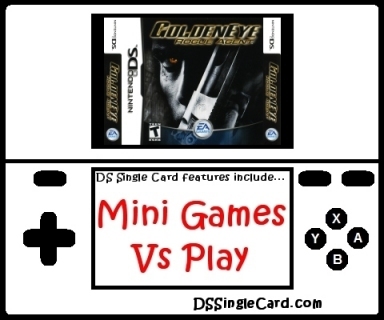 GoldenEye: Rogue Agent came out just a few months into the original Nintendo DS's existence. It was the first First-Person Shooter (FPS) on the system, and remained the only one of its kind for two years. Intended to follow up the hype and accolades of the original GoldenEye game for the Nintendo 64, it is also the first (only?) James Bond-based video game where you don't play as James Bond. The game, while not terrible, was far from the great success that was hoped for. As far as the control schemes go, the developers made sure that the options were there and that they were many, but they didn't make sure that the options were as accurate as they could be. The graphics were an impressive 3D for as early as this game was. The game is playable, and if looked at from a campy perspective, it's fun... assuming you can get past its shortcomings. There're definitely better FPS games on the Nintendo DS now: most notably, Brothers In Arms DS, Call Of Duty 4: Modern Warfare, Call Of Duty: World At War, and the soon-to-be-released Call Of Duty: Modern Warfare Mobilized, among others. I can't recommend GoldenEye: Rogue Agent above any of them (I've only review one of them, after all), but it's a fun playthrough... for a patient player. Speed up turning using button control schemes. Allow the host to select which multiplayer stage is used, even if it has to be unlocked (like the stages for multi-card play). Click here to return to the DSSingleCard.com GoldenEye: Rogue Agent profile.